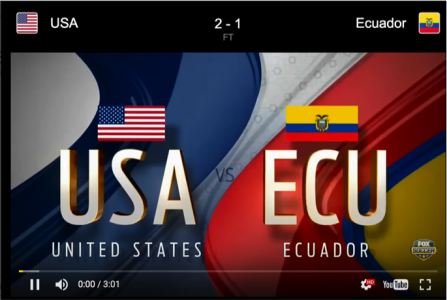 When Ecuador’s Michael Arroyo finds the back of the net with a goal to put his country on the scoreboard in its Copa America quarterfinal matchup with the United States, an unlikely friend of mine is sent into a passionate frenzy. I met Norberto Urgiles just two weeks ago, and he’s already become much more than a coworker to me. Though my team just conceded a goal, I can’t help but smile as I watch Norberto run in circles around the back room of our shared workplace, waving his hands in the air in pure happiness. In jest, I yell back at him a reminder that his team is still trailing. But in the moment, Norberto is completely unconcerned with his home country’s 2-1 deficit. In the moment, he’s found hope – and happiness – in his team, the Ecuador national soccer team. As I stand there, watching him celebrate, I begin to realize just how big the difference is between the importance of this game to each of us. We had been listening to the whole game while finishing up a Thursday evening shift in the kitchen, and my reactions to the USA’s two earlier goals had been nowhere near the level of elation Norberto had just displayed. For me, a college kid from Minneapolis, a Copa America quarterfinal for the USA doesn’t mean much. I’m not a big soccer fan; I’ll watch the World Cup, but I wouldn’t have been following this game had I not been with Norberto. For him, it couldn’t have meant much more. For Norberto, a 20-something Ecuadorian immigrant, watching his country’s “fútbol” team play is one of his greatest passions. It connects him to his childhood home, a small South American nation where many members of his family still live, 3500 miles from his new home of Minnesota. It also provides an escape from his busy life as an immigrant. Norberto works seven days a week at the restaurant, MyBurger. When he’s not at work, he’s taking classes at a nearby community college. He tells me often of his hopes of one day being able to take a better job. 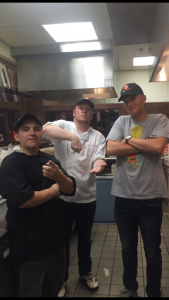 For the time being, with a family at home, he’s got to clock in every day and lead the kitchen. I truly believe watching Ecuador play is an outlet for him to forget about all that. When I was hired for a summer position as a cook at the burger joint near my house, I was not even looking forward to the job. It was something I had to do to make some spending money for college. Yet, two weeks after I started, here I am sharing an unforgettable moment with someone I considered a good friend. Norberto has been nothing but warm and welcoming to me as he trains me for my new job. He keeps things light in the kitchen with his unrelenting sense of humor and iffy-at-best dance moves, and his kind, charismatic personality is growing on me quickly. Eventually, the final whistle sounded; Ecuador had run out of time. I should’ve been happy. My country’s team had just defeated his. I had the upper hand in our friendly rivalry. Yet, as I stood there and thought about what the game meant to him, I couldn’t help but wish Ecuador had completed the comeback.